Most of us are familiar with the Browning High Power. The High Power or P 35 is among the most successful military pistols of all time, and immensely popular with civilian shooters world wide as well. Over the years there have been various attempts at converting the single action High Power to a double action design, but few have been successful. Recently, FN or Fabrique Nationale has introduced a pistol that appears to be a successful transition of the High Power into a modern double action only handgun. While many professionals prefer the single action design for sound reasons, practical considerations prevent the single action from being adopted for general police issue. The new pistol not only makes the most of the concept, it offers genuine improvements over the original High Power. The pistol is intended as a law enforcement product and is marked FN HP DAO, but the handgun is available to all buyers. 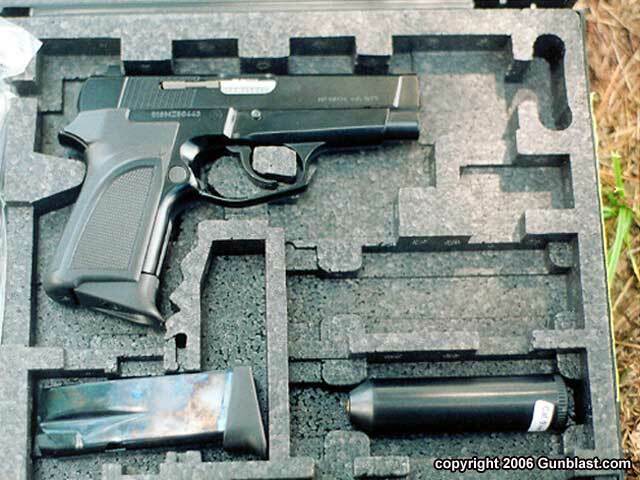 At present, the pistol is available in 9mm Luger only. The pistol is offered in a compact version, a first for FN production of the High Power. There have been clones of the High Power offered in ‘Detective’ format and numerous low production runs or prototypes, but this is the first general production run of the compact High Power. 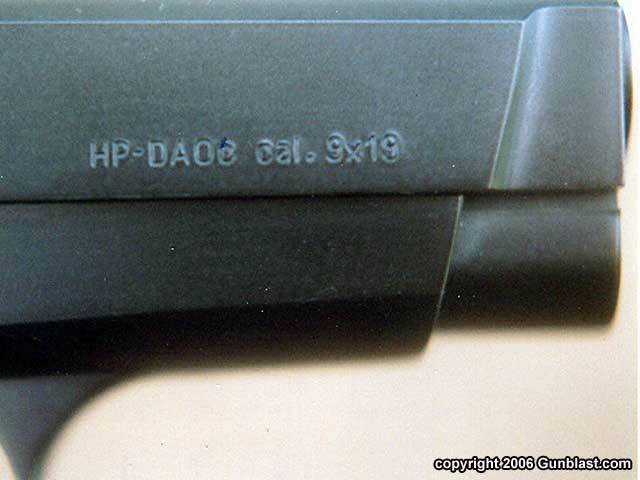 When examining the HP DAO, the gun is recognizable as a Browning derivative, but the pistol is far different from the High Power. It is obvious some effort has been made to preserve the outline of the High Power while offering considerable improvements. Over the years there have been criticisms of the High Power design centered upon longevity and ruggedness. The pistol is reliable but there are certain trouble spots. The FN HP features a redesigned extractor that will answer many of these complaints. The frame and slide are different and even the magazines differ from the High Power. This is a thoroughly modern handgun. The sights are high visibility and the finish a dull matte that should prove durable in service. The FN features a newly designed firing pin block that is quite interesting. 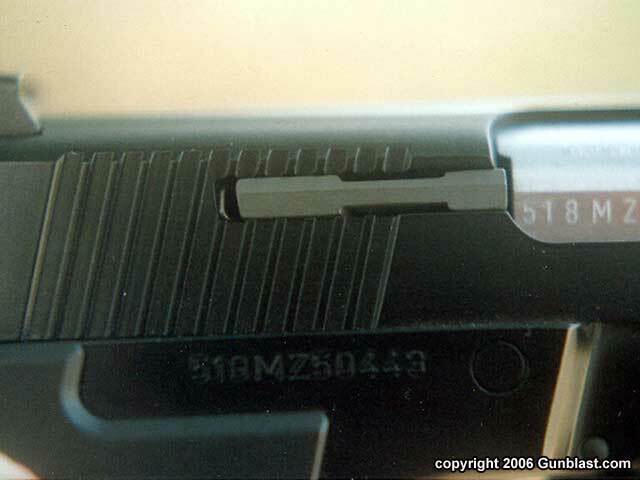 When the trigger is fully pressed to the rear, the firing pin block, located at the rear of the slide, rises slightly. When this block rises, the hammer may strike the firing pin. At any other time the firing pin is positively blocked from any access to the hammer. This answers the need for a positive firing pin block or drop safety in modern production. As for the FN’s trigger compression, it is surprisingly smooth with a short travel. Total compression is right at 9 ½ pounds. This is an outstanding double action only trigger press. 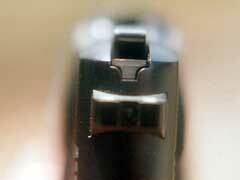 The action is not set by the slide, the trigger may be pulled again and again in practice. This design also offers a second strike capability in case of a dud round. 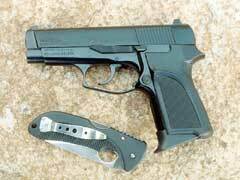 The pistol features a hooked trigger guard and modern thumb swell grips. There is no manual safety or decocking lever and none is needed. The slide stop is an extended affair that worked well in practice. The magazine release is all Browning, easily reached by short fingers but not apt to drop the magazine at an inopportune moment. Overall, a very nice pistol, well designed and executed. Our pistol is a compact version, featuring a 3 ½ inch barrel. The pistol tips the scales at 32 ounces. A sole criticism of the pistol in several weeks of testing and evaluation was the grips or stocks. They could have been more compact, without the thumb rest. This would have made for a more concealable handgun and one more friendly to small hands. Just the same, no one felt the pistol was too large for their hands. Thinner grips would have been more comfortable. The firing test produced no surprises, as we expected the handgun to be reliable. 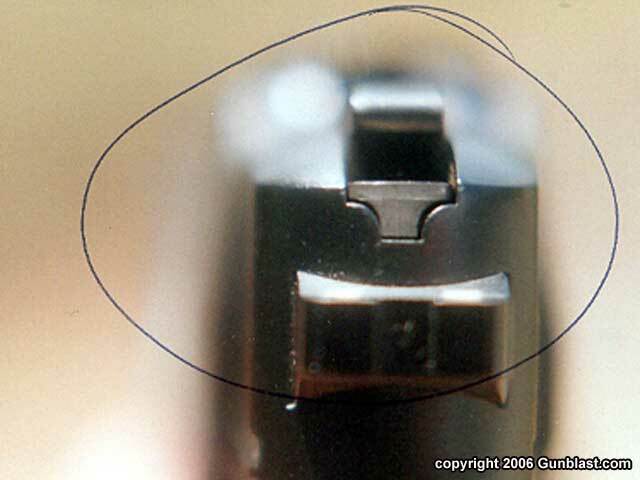 But we were pleased with the smoothness of the double action trigger as well as a complete lack of interference from the hammer. The spurless hammer was most unobtrusive in rapid fire or in handling drills. The pistol was field stripped and lubricated with a good coat of Birchwood Casey gun oil before the initial testing, and we have enjoyed several range sessions with the handgun. 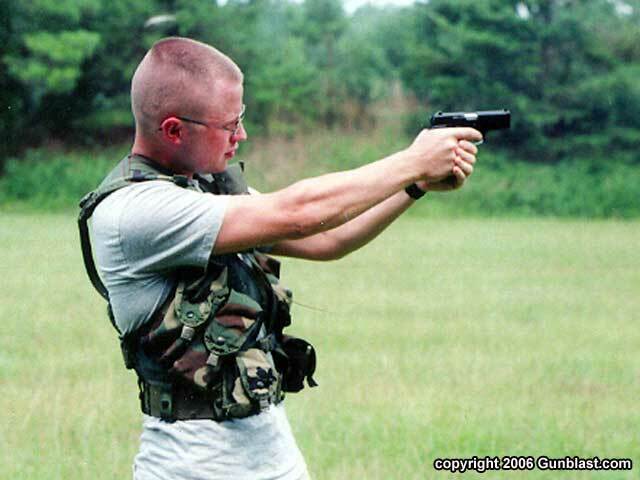 What counts with a personal defense handgun is quick down-and-dirty shooting, and this gun excels in that regard. The HP DAO comes onto the target quickly. 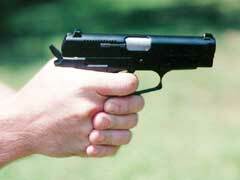 The trigger is controllable and the handgun does not exhibit uncomfortable recoil. I found I could draw, get on target, and get two or three quick hits ACCURATELY placed as well as with any handgun at five to seven yards. In short, this is an excellent handgun for general defense use. At longer ranges the single action pistol is easier to make a hit with, and larger guns will also show an advantage, but keep in mind this is a compact pistol designed to be comfortably carried for long periods of time with a minimum of tugging on the trousers. In that light, this is a successful design. 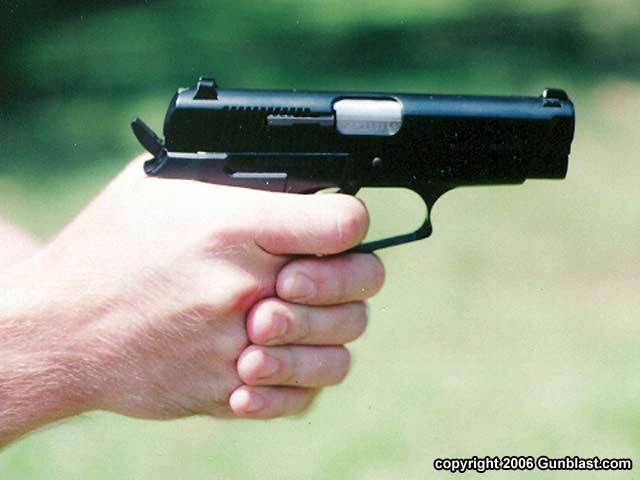 The pistol holds ten rounds in the abbreviated magazine, giving a full eleven rounds on tap for defensive situations. 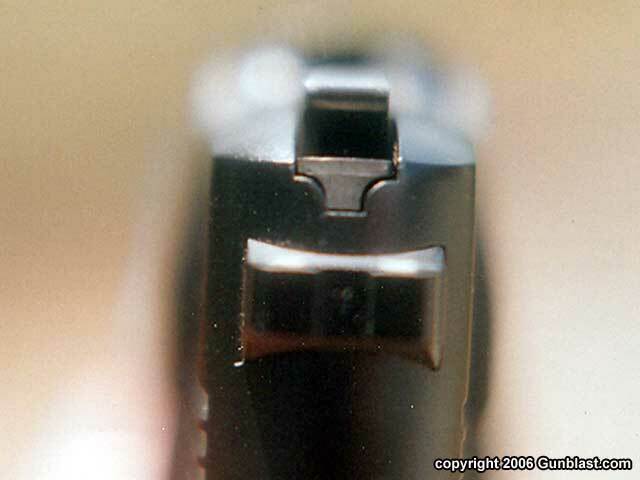 The older High Power magazines will not fit this gun, so be certain to order the correct spares. During the test fire stage, I used inexpensive ball ammunition for the most part. This included the Cullman, Alabama produced Zero remanufactured ammunition, an excellent source for inexpensive practice ammunition, and my own hand loads using Sierra 115 grain FMJ bullets over HP 38 powder. There were no failures to feed, chamber, fire or eject in firing over 350 rounds of ball ammunition. Zero 115 grain FMJ 1121 3.0"
Zero 115 grain JHP 1134 2.8"
handload: Sierra 115 grain FMJ / HP 38 1090 2.9"
Handload: Sierra 115 grain JHP / Titegroup 1125 2.5"
Federal 124 grain Hydra Shock 1090 2.4"
Federal 147 grain Hydra Shock 974 2.8"
The limiting factor is the long double action trigger, but this trigger offers a good cadence in rapid fire and is a simple mechanism well suited to personal defense. Simply draw, line the sights up, and fire. That simplicity has much appeal to many shooters. Overall, I find the HP DAO a good handgun well suited to the rigors of personal defense. Of the many handguns I have tested in the past few years, this is among the highest quality to cross my desk, with obvious care in manufacture and attention to detail. It should serve well. This is the new FN HP, shown with an Emerson Hard Use folding knife. HP DAO is clearly marked on the abbreviated slide. Our resident soldier found the HP DAO a good pistol. In rapid fire the HP DAO handles well, offers real control. Note the ‘stub’ hammer. The FN HP DAO comes in a workmanlike case. The device at the bottom right is a cleaning kit. The FN hammer/firing pin block is a good addition to a proven design. I like this device, it is unobtrusive but adds to the safety of the handgun.